publication serving the Paleo community. We are dedicated to providing our subscribers with the information they need to live healthy, active lives. Each bi-monthly issue is packed with the latest research, exercise and nutrition, interviews, inspirational stories, recipes, reviews, info to raise Paleo kids and much more! With each annual subscription, you’ll receive a hard copy of the magazine mailed straight to your preferred address weeks before it is available on newsstands! 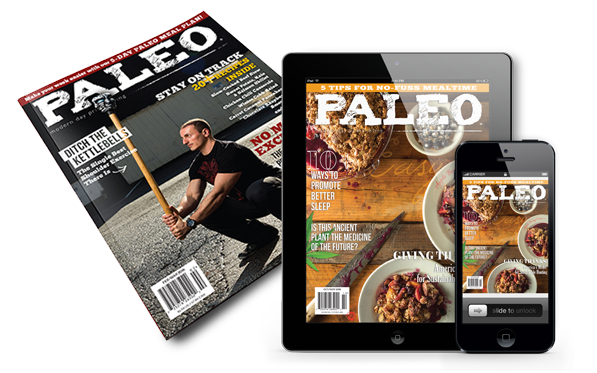 In addition, you’ll receive immediate access to the current, as well as our entire digital library of back issues, through the free Paleo Magazine app. Each issue contains 20+ mouth watering Paleo recipes with high quality images of each. Each issue features multiple articles on functional movement, mobility and strength training in a natural environment. Each issue is packed with articles covering such topics as: the importance of play, sleep, unplugging from electronic devices, and stress reduction. Subscribers receive their issue weeks before it’s available on newsstands! Subscribers get instant access to all web content and our full digital library of 30+ issues! Subscribers can get free issues by referring friends! Melissa Joulwan is the author of the cookbooks Well Fed: Paleo Recipes For People Who Love To Eat and Well Fed 2: More Paleo Recipes For People Who Love To Eat, and her blog MelJouwan.com, where she writes about her triumphs and failures in the gym, in the kitchen, and in life. Stephanie Gaudreau is the author of the bestselling book, The Paleo Athlete and the award-winning The Performance Paleo Cookbook. She combines a format education in biology / human physiology, 12 years of science teaching experience, holistic nutrition training, and an unabashed love of tasty Paleo food on her blog. receiving your first issue, simply cancel for a full refund! Save money and time by having your subscription automatically renew! Rest easy knowing you’ll have the one and only Paleo Magazine delivered right to your door for years to come! What types of subscriptions does Paleo Magazine offer? Print+Digital 1 Year: $29.95 ($36.25 Canada or $90 International) you will receive 6 print issues/year, mailed to your address. You will also receive digital access to all current and past issues on both our website and mobile app. This subscription is both print AND digital. Digital Only: We offer digital subscriptions, and single issues, through third party carriers such as iTunes, Google Play and Amazon. While our app with each provider is free, the content is not (however, we do provide some free content within the app). You can purchase your digital copies through the respective parties. We do not have access to these accounts nor will you receive a print copy of the magazine with this subscription. Our customer service department cannot access these accounts nor can we give out refunds for them, you must contact your app carrier. Often these subscriptions are set to auto-renewal by default. When will I get my first print magazine? Because we are a bi-monthly publication, your first issue will arrive in approximately 8-12 weeks, depending on when you subscribe. If the magazine is already in production or on store shelves you will receive the issue AFTER it. However, when you register for your subscription you can enter an email address which allows you access to all current and past digital issues on our website and mobile app instantly. 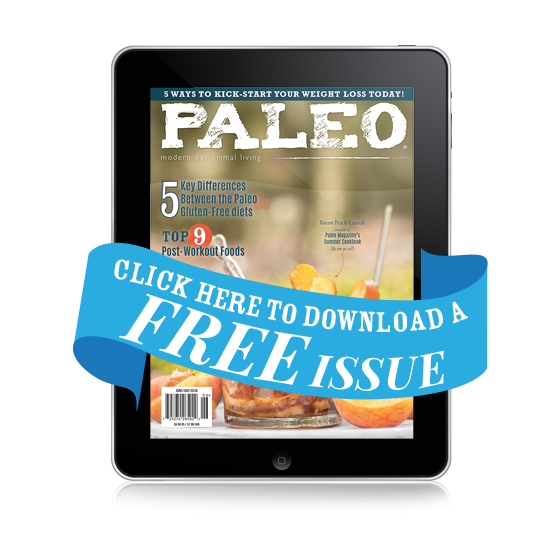 What is the Paleo Magazine Refund Policy? We strive to make all customers happy, even those who choose not to continue their subscription with us. For print subscriptions we can only process a refund if one issue has been mailed. We cannot process partial refunds. If more than one issue has been mailed we can cancel, suspend or transfer your subscription but we can no longer process a refund after one issue. To cancel, suspend, transfer or refund your subscription please contact cs@paleomagonline.com as soon as possible. If your subscription is a digital only subscription please contact your mobile app provider for their refund and cancellation policies. I received an email stating I received a current digital issue do I also get a print copy? If you subscribed to Paleo Magazine on our website or mailed in a check, and paid $29.95 (or $36.95 Canada) you WILL receive a print issue as well. Please allow 8-12 weeks to receive your first copy. This email is just regarding directions on how to access your digital subscription – which is a free extra to all print subscribers. I signed up through iTunes or Google Play will I receive a print issue with this subscription? No. If you signed up for the mobile app through a third party carrier like iTunes or Google Play, you will not receive a print issue. Only subscribers to our print version receive a hard copy. Will my print subscription be auto-renewed at the end of the 6 issues? Only if you selected the $24.95 Auto Renew option when subscribing. Can I purchase past print issues? Yes! Back issues are available on our online store. If an issue is not listed, then it is no longer in print and is no longer available. You can however find all back issues via our digital app. Note: you can also purchase other Paleo Magazine gear and products on our store as well.